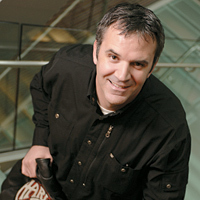 High-gear career: MMM allowed Matt Levatich '94 to shift into a VP role at Harley-Davidson. "A broad knowledge of technologies and their applications is something you wouldn't learn in a typical MBA program," explains Vinayak Dravid, professor of material science and engineering and director of the Atomic and Nanotech Characterization Experimental Center at Northwestern. In his nanotechnology course, an elective in the MMM curriculum, Dravid provides students with an overview of the subject, explains the business model for nanotechnology startups, the implications for intellectual property, and how technologies influence ethics and society. "Tomorrow's leaders need to be aware of emerging technologies because of their rapidly expanding role in business," says Dravid. "Nanotechnology has the ability to impact all aspects of business. It is a potentially disruptive technology with far-reaching implications." Professors such as Dravid often provide learning experiences outside the classroom as well as inside, when students form partnerships with faculty by researching the commercial viability of technologies they have developed, create business plans and even work with the professors in start-up companies. "We've had a number of success stories in which either professors or students have decided to start a company based on the student's analysis of the commercial viability of their technology or product," says Dravid. For instance, in 1998, MMM students Bill Fierle, Carlos Carbajal, Dan Gordon, Eugene Ho, Nikhil Shah and Peter Agnvall (all '98 grads) worked with mechanical engineering professors Ed Colgate and Michael Peshkin to roll out Cobotics Inc., a company that developed and marketed Intelligent Assist Device technology for use in material handling applications. Stanley Assembly Technologies acquired the company in 2003. In 2004, Dravid worked with MMM students Andreas Pecher, Praneet Gupta, and Sam Mehta (all '05) to develop a business plan for NanoSense, a nondestructive imaging product based on a scanning near-field ultrasound holography method to image elastic and visco-elastic variations across a sample surface and reveal sub-surface features and defects critical in microelectronics industries. The students themselves came close to starting up a company with Dravid's technology, and Dravid is still considering launching the company himself. "Whether or not actual companies are created at the end of these projects, they are all successful from an educational standpoint in terms of giving students the opportunity to solve real-world problems," Dravid notes. "Very few programs give you the opportunity to do this kind of collaboration," says Hopp. Students who don't take on staff projects get real business experience in the program's second year through the Integration Project, in which students serve as consultants to leading manufacturing companies or develop a business venture based on a new product. Classroom experience is complemented with visits to domestic and overseas manufacturing facilities, conferences and extracurricular activities and clubs. Some plant visits are offered as formal program activities while others are organized by students themselves. In recent years, students have leveraged MMM connections with industry to organize field excursions to nearby manufacturing facilities such as Toyota and Illinois Tool Works. As part of the Kellogg School program, students also visit facilities in China, Vietnam, India and South Africa through the Global Initiatives in Management (GIM) class, an intensive business leadership course designed by students in close consultation with faculty advisers. Nearly 400 students typically participate in the annual course, a challenging 10-week curriculum that culminates with a two-week international field experience. In March, Karen Greig '06 participated in a GIM trip to India led by Kellogg School Professor Bala Balachandran and visited a number of locales, including information technology companies Wipro and Infosys, HSBC Bank and Tata Consultancy Services and Lucent Technologies' fledgling Bell Labs. 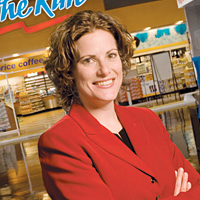 "The perfect mix": Kim Matthews '04 added finance and marketing to her manufacturing skills to run down a job as ExxonMobil planning adviser. "The course and the trip taught me a lot about how technology is flattening the globe," says Greig. "Having worked and studied with many Indians here in the U.S., it was wonderful to be able to visit their country to see the diversity of culture and the complex changes happening there. While tons of progress has been made recently in many parts of the country, there's [still] so much challenge and opportunity in India for business to take on...."
Matthew Lippert '06 participated in a GIM trip to Brazil, where he evaluated the factors behind the success of "Flex Fuel" vehicles, which can run on any mix of ethanol or gasoline, learned about the technology and manufacturing process, and evaluated their applicability to other parts of the world. "It was really an excellent trip in that we were able to talk with people from each of the affected parties: auto manufacturers, oil and ethanol producers and government officials," he recalls. "My project touched on a number of areas that are core to the MMM program, such as innovation and manufacturing, but also tied into the broader MBA curriculum." Curriculum changes in the MMM program result from market changes, student demand, and insights from a 35-member advisory board which meets twice a year with faculty and students. "The program's academic focus has shifted over its 15 years," says Hopp. "In the early '90s, we emphasized the importance of quality. In the later '90s, emphasis shifted to supply chain management. Today, business is focused on innovation and new product design, so we are revising the curriculum." This spring will mark the first MMM conference on innovation, which will be added on to the annual Kellogg Manufacturing Business Conference. Hopp plans to invite leading-edge companies to provide details about how they are managing and accelerating innovation. "Another thing we're now working on is growing and developing our New Product Innovation course," says Hopp. "Last year, we began focusing the course on one market space, such as the airline industry, within which students explore opportunities and actually create products." Craig Sampson, health practice lead for global design consultancy IDEO and an adviser and key lecturer in the New Product Innovation course, sees this as a valuable approach. "When students focus their research and design efforts on a particular opportunity space, there is more collaboration and a cohesive body of knowledge begins to develop, resulting in richer solutions," explains Sampson. "All students who go through New Product Innovation get a glimpse of what it takes to design products and to be truly innovative," he adds. Team-based, multi-disciplinary innovation may be the most important thing students learn from the program, he believes. "MMM is unique in that it brings together students with diverse technical and business experiences from the world today. We build on that foundation to help them understand relationships between technology, business and human needs. There are very few places where those three bodies of knowledge come together, but that's where innovation happens," says Sampson. One outstanding trait that MMM students demonstrate is an understanding of what it takes to design and build a product, Sampson notes. "Just like teams at IDEO, we have student teams embrace a culture of prototyping to quickly iterate all the way from needs identification to designing for manufacturing," he says. "When done well, we are not just designing products, but designing the future." A MMM education often enhances students' internship and job opportunities in product-oriented companies. The program gives students career flexibility that opens up rewarding options within a broad range of functions, including finance, marketing, operations, general management and consulting. "MMM grads use their manufacturing background to bridge the divide between a venture's business side and its engineering side," says Hopp. For example, they understand the implications of a marketing strategy and can talk to the engineers on the factory floor in a way someone without that knowledge would find difficult or impossible. "This combination of breadth and depth gives MMM grads enormous power and trust in their jobs," says Hopp, "and is an approach garnering growing attention from industry leaders." Greig is one student already benefiting from her MMM experience. "My summer internship as a project manager at Motorola in its Customer Center for Solutions Integration was a job I received due to my pursuing engineering management as well as business administration," says Greig. "By the time I graduate, I know that the contacts and education I have received from both schools will help me find a career that balances technology and business - and which will put me at the cutting edge of thought that will drive future innovation."